Welcome to Designs & Downloads, the ABA materials resource center. D & D is home to all files, designs, handouts, and images offered to members for store marketing DIY; IndieBound-specific marketing DIY; ABA Education handouts and summaries; IndieCommerce contracts; Membership applications and more. For links to the E-FACT Action Kit for your state please visit the Advocacy section. Begin your exploration of Designs and Downloads with the subject index in the top left box. 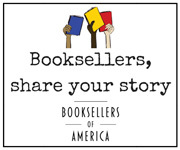 NOTE-Files that are marked with the lock icon are available to ABA bookseller members only. Some designs are available as posters and more from RedBubble.com.